This is what I had for breakfast last Wednesday when I had my blood work done at Makati Medical Center. I was already famished by 8am because my blood test required fasting. I haven’t eaten or drank anything for 12 hours, so I was eager to have my first meal of the day. I wanted a healthier breakfast, so I ordered Fish Fillet, instead of their beef tapa. This is pan-fried cream dory seasoned with salt and pepper, served with tomato-onion salsa and rice. It was an ordinary meal, so I wasn’t really expecting anything grand or amazing. What I liked about it was that it had just the right amount of salt, plus the side dish of tomato-onion salsa perfectly complemented this simple fish dish. This went well with the slightly sweet Tapa King sauce that they gave me. I would have wanted my cream dory coated with crispy breading, though, for a more delightful bite. 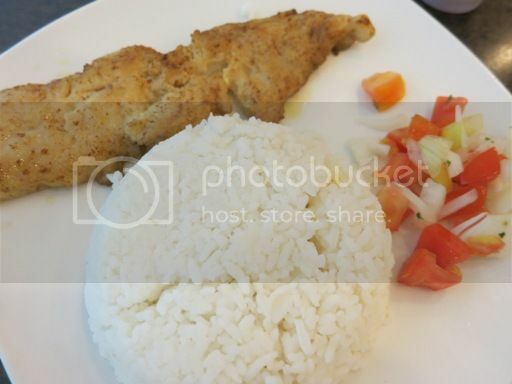 This entry was posted in Fish Fillet, Makati Medical Center, Tapa King. Bookmark the permalink.